Meteora is a world Heritage site and the largest and the most important complex of monasteries in the whole Greece after Mount Athos. The religious sanctuary protected by the Orthodox Church is a living link between the Byzantine Empire and the modern world. Rocks of Meteora are a miracle of the natural forces of geology, a cluster of rock pinnacles adorned by the sacrosanct monasterial community. The stone giants of Meteora stand still, silent and proud with their imposing aspect witch breaks off the monotony of the landscape of the vast Thessalic plain right above Kalabaka and the picturesque Kastraki, causing awe and ecstasy. The formation of Meteora includes events occurring throughout 700 million years of the geologic past and the first points of hermit life in the coplex of these rocks were as early as in the 9th century. At the very beginning hermitic monks climbed the rocks of Meteora to live atop the pinnacles, sheltering within erosional fissures in the sacred formations themselves. Between the 11th and 17th century, twenty-four monasteries were built, eight of them still standing but six remaining in use to this day continuing the monastic life: the monastery of the Great Meteoron, Varlaam, Saint Stephen’s, Saint Nicholaos Anapafsas’, Rousanou and Holy Trinity. Furthermore, another two monasteries (Saint Nicholaos Badovas and Ipapandi’s Monastery) have been renovated and are preserved by the greater ones, that have undertaken them as dependencies. The earth of Meteora and its geology provides the source of the spiritually and environmentally unique realm that is Halfway to Heaven. Kalafati Domniki is a qualified tour guide based in Kalambaka, respecting the culture and especially the religious tradition of our country, welcomes you and believes will provide you memorable visits to the monasteries of Meteora and the sights of historic and archaeological sites of northern Greece! You can contact everyday at the following telephone numbers: +30 6972587873 & +30 6932850035. All of these monasteries are located at Metéora in Greece, and most are perched on high cliffs and accessible by staircases cut into the rock formations. They were created to serve monks and nuns following the teachings of the Greek Orthodox Church. Much of the architecture of these buildings is Athonite in origin. Of the six intact monasteries, the Holy Monastery of St. Stephen and Monastery Roussanou are inhabited by nuns. 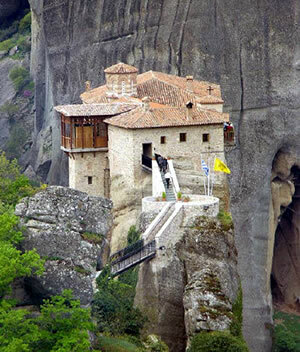 The Holy Monastery of Great Meteoron – This is the largest of the monasteries located at Metéora. It was erected in the mid-14th century and was the subject of restoration and embellishment projects in 1483 and 1552. The building serves as the main museum for tourists. The Katholikon (main church), consecrated in honour of the Transfiguration of Jesus was erected in the middle of 14th century and 1387/88 and decorated in 1483 and 1552. The Holy Monastery of Rousanou/St. Barbara was founded in the middle of 16th century and decorated in 1560. The Holy Monastery of St. Nicholas Anapausas, built in the 16th century, is a small church. It was decorated by the Cretan painter Theophanis Strelitzas, in 1527. The Holy Monastery of St. Stephen is a small church built in the 16th century and decorated in 1545. This monastery rests on the plain rather than on a cliff. It was damaged by the Nazis during World War II who believed it was harboring insurgents and was abandoned. Nuns took it over and reconstructed it. 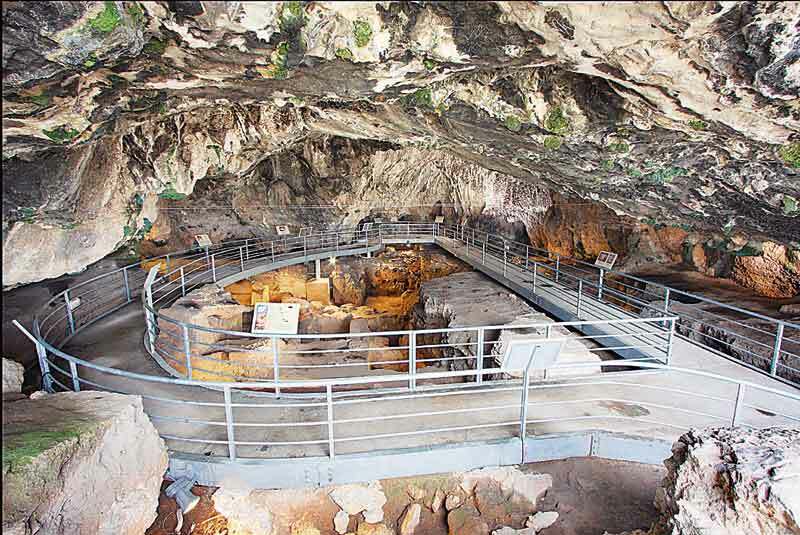 The Theopetra caves 5 kilometres (3.1 mi) south of Meteora had inhabitants fifty millennia ago. The oldest known example of a man-made structure was found within a prehistoric cave in central Greece, according to the Greek culture ministry. The structure is a stone wall that blocked two-thirds of the entrance to the Theopetra cave near Kalambaka on the north edge of the Thessalian plain. It was constructed 23,000 years ago, probably as a barrier to cold winds. “An optical dating test, known as Optically Stimulated Luminescence, was applied on quartz grains nested within the stones. We dated four different samples from the sediment and soil materials, and all provided identical dates,” Nikolaos Zacharias, director of the laboratory of archaeometry at the University of Peloponnese, told Discovery News. According to a statement by the ministry of culture, “the dating matches the coldest period of the most recent ice age, indicating that the cavern’s inhabitants built the stone wall to protect themselves from the cold.” Excavated since 1987, the Theopetra cave is well known to palaeontologists as it was used and inhabited continuously from the Palaeolithic period onwards (50,000 to 5,000 years ago). In 1344, Athanasios Koinovitis from Mount Athos brought a group of followers to Metéora. From 1356 to 1372, he founded the great Meteoron monastery on Broad Rock, which were perfect for the monks; they were safe from political upheaval and had complete control of the entry to the monastery. The only means of reaching it was by climbing a long ladder, which was drawn up whenever the monks felt threatened. At the end of the 14th century, the Byzantine Empire’s 800-year reign over northern Greece was being increasingly threatened by Turkish raiders who wanted control over the fertile plain of Thessaly. The hermit monks, seeking a retreat from the expanding Turkish occupation, found the inaccessible rock pillars of Meteora to be an ideal refuge. More than 20 monasteries were built, beginning in the 14th century. Six remain today. There is a common belief that Athanasios (founder of the first monastery) did not scale the rock, but was carried there by an eagle. Access to the monasteries was originally (and deliberately) difficult, requiring either long ladders lashed together or large nets used to haul up both goods and people. This required quite a leap of faith – the ropes were replaced, so the story goes, only “when the Lord let them break”. In the words of UNESCO, “The net in which intrepid pilgrims were hoisted up vertically alongside the 373 metres (1,224 ft) cliff where the Varlaam monastery dominates the valley symbolizes the fragility of a traditional way of life that is threatened with extinction.” In the 1920s there was an improvement in the arrangements. Steps were cut into the rock, making the complex accessible via a bridge from the nearby plateau. During World War II the site was bombed.Many art treasures were stolen. Beside the Pindos Mountains, at the western region of the Thessaly plain in the middle of northern Greece, these sandstone rocks rise from the ground. The rocks are composed of a mixture of sandstone and conglomerate. They were formed about 60 million years ago. A series of earth movements pushed the seabed upwards, creating a high plateau and causing many fault lines to appear in the thick layer of sandstone. t the pinnacles did not exist 2000 years ago; a theory dismissed by modern geologists. The cave of Theopetra is located 4 kilometres (2.5 mi) from Kalambaka. Its uniqueness from an archeological perspective is that in it contains, within a single site, the records of two greatly significant cultural transitions: The replacement of Neanderthals by modern humans, and the later transition from hunter-gathering to farming after the end of the last Ice Age. The cave consists of an immense 500 square metres (5,400 sq ft) rectangular chamber at the foot of a limestone hill, which rises to the northeast above the village of Theopetra, with an entrance 17 metres (56 ft) wide by 3 metres (9.8 ft) high. 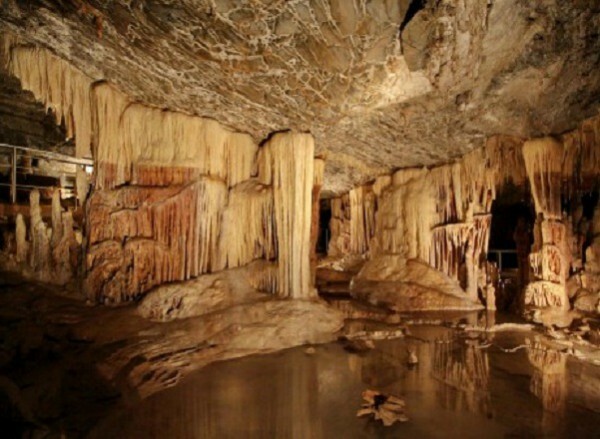 It lies at the foot of the Chasia mountain range, which forms the natural boundary between Thessaly and Macedonia prefectures, while the Lithaios River, a tributary of the Pineios River, flows in front of the cave. The small Lithaios River flowing literally on the doorsteps of the cave meant that cave dwellers had always easy access to fresh, clean water without the need to cover daily long distances to find it. Excavations and research and have discovered petrified diatoms, which have contributed to understanding the Palaeo-climate and climate changes. Radiocarbon dating evidences human presence dating back 50,000 years. The cave is open to the public. The climate in the region varies greatly according to the time of year. It may be sweltering during summertime, but extremely cold in wintertime. Rainfall is generally heavy all year round, especially at higher altitudes, but the driest time of the year is during summer.